How long is too long to wait for help when you call 911? The Seattle Police Department’s target response time for priority-one calls is seven minutes, but they consistently miss that in certain parts of town, and for certain types of reports citywide. If you called 911 after overhearing your neighbors’ harrowing late-night fight, how long would 18 minutes feel as you waited for the cops to arrive? A Ballard resident might be able to tell you, because that’s the average response time for a priority-one domestic-violence assault call in that neighborhood. The target time, citywide, for all priority-one calls — reports of the most urgent situations — is less than seven minutes. The problem is that the Seattle Police Department (SPD) is consistently missing that target, not only for specific areas of the city, such as Ballard and much of Northwest Seattle, but also for certain types of calls — domestic violence among them. I found these trends by analyzing five years’ worth of priority-one 911 call data, from 2010 through 2014 — more than 180,000 such calls. But for whatever reasons, that is not what’s happening on the ground. Some parts of Seattle get consistently fast service. In the Pike/Pine section of Capitol Hill, and the adjoining area near Seattle University, the response time to priority-one calls averaged well under five minutes. That’s the fastest in the city. At the other end of the spectrum is the North Beach/Blue Ridge section of Northwest Seattle, at just shy of 14 minutes, nearly three times longer. Which was news to Whitcomb. “I’m more than a little surprised at that variance,” he told me. To be fair, most of the time, the department meets its goal for priority-one 911 calls. Citywide, for three out of five calls, officers are at the scene within seven minutes. But that might be small consolation if your call is among the more than 7,800 — 4 percent of all calls — that took longer than half an hour. 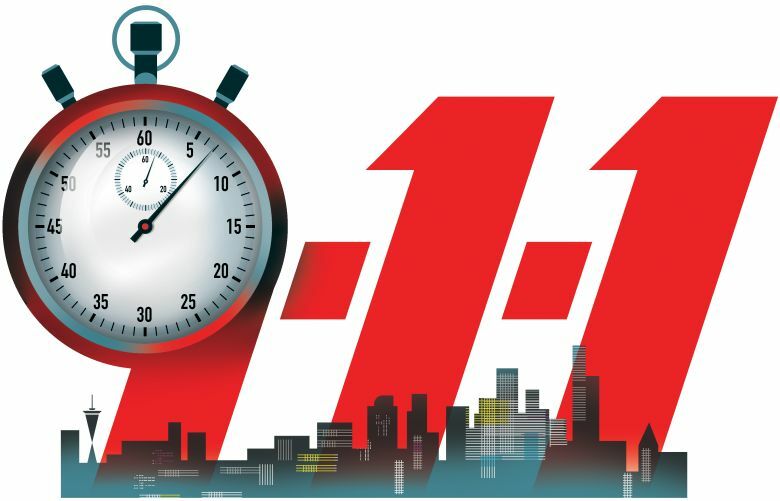 And that broaches a separate concern: Even though all priority-one 911 calls have the same target-response time of seven minutes, the actual times vary considerably by crime. An in-progress robbery and burglary, a fistfight and reports of gunshots are examples of calls where help arrives well within the seven-minute goal, on average. An officer in need of help is the quickest — less than two minutes. But if you call for a domestic-violence assault, the average citywide wait time is more than 10 minutes. The response to an in-progress violation of a restraining order is even slower — more than 15 minutes. With that in mind, Maxey said the SPD reviews selected calls with exceptionally long response times. In response to the report, the SPD is currently undertaking various remedies; among the recommendations in the report are increased staffing inside the 911 call center, additional lines for the 911 network, and improvements to the CAD (Computer-Aided Dispatch) system. A new high-tech Real Time Crime Center, which opened in October, provides instant analysis of 911 data and trends, and is intended to help officers respond to calls more efficiently.